Here in Tajikistan, I’m happily used to life without ATMs, laundry machines, microwave ovens, and reliable internet and electricity. I’m used to being unable to drink the water without straining out little pieces of leaves, twigs, and god-knows-what and then boiling it for 10 minutes. 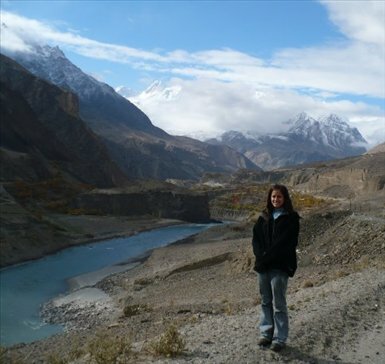 I’m used to being the only expat, the only woman, and the only person under 25 in the vast majority of my activities (a triple whammy of disadvantage in a place where the most respect is granted to those who are Tajik, male, and old). I’m also used to things NEVER going as planned. Much to my mother’s chagrin, I don’t miss home at all. That’s admittedly something I’ve never been good at – missing ‘home’ – which is probably caused by a preference to throw myself into whatever I’m doing, wherever I am, and to try to experience things to the fullest. On the rare occasions that I’m having a less-than-stellar day, I can no longer listen to Pink Floyd on surround sound or traipse through Guelph’s parks with Bear – but I can cuddle up with my 4-year old housemate to play Clapton on my untune-able borrowed guitar. When I’m on the hunt for food, I no longer resort to scouring the aisles of No Frills for weekly deals on avocados, soy protein, and 12-grain bread, and instead get to barter with vendors at the bazaar down the road for ‘neem [half] kilos’ of local apricots and walnuts and slabs of piping hot naan. I’ve resigned myself to the fact that I will never be seen as an equal in the ring or on the court by my (all-male) boxing and indoor soccer buddies, but I do cherish the countless chivalrous gestures accorded to me at mealtimes and in daily life simply for being a woman. A sucker for mountains and picturesque landscapes in general, I spent the first few trips to the field ooh-ing and ahh-ing with my nose pressed against the windowpane; while still amazed by every single peak and valley, the 18-hour drive from Khorog to Dushanbe is now familiar enough to elicit the feeling of returning 'home'. After being here for over 5 months, the things that used to strike me as mind-blowingly unusual are now quite normal parts of everyday life. Thanks to a level of curiosity akin to a 5-year old’s, I will always be awed by certain things, but I suppose it’s only human to start ‘normalizing’ after a while. The only thing that scares me ever so slightly is if I’ll be able to normalize back to Canadian standards – and the sneaking suspicion that I might not even want to.